Acura NSX finally revealed in production form. Was it worth the wait? 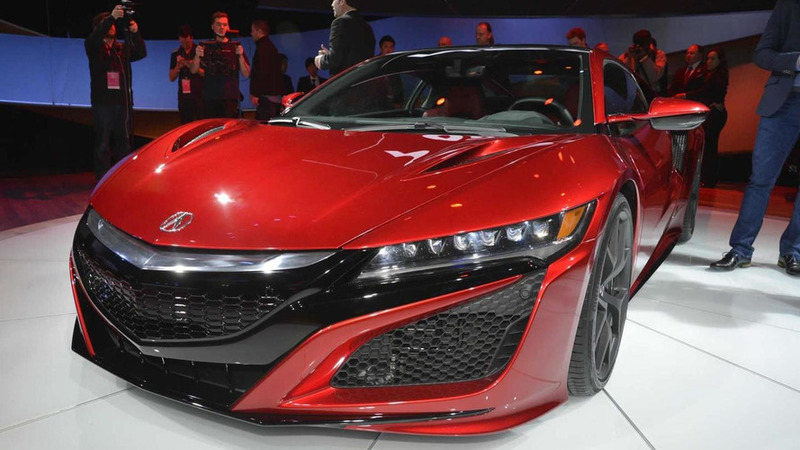 After a rather lengthy development process, Acura has finally unveiled the production-ready NSX. The second generation Acura NSX draws most of its styling cues from previous concept but everything else has changed as Acura has decided to ditch the naturally aspirated V6 of the 2013 concept in favor of a longitudinally-mounted twin-turbocharged V6 developing “north of 550 horsepower.” The conventional engine works together with three electric motors sending all power to both axles to form what Acura calls the Sport Hybrid Super Handling All-Wheel Drive. Two of the electric motors are mounted up front for torque vectoring while the third direct-drive motor sits at the back between the combustion engine and the newly developed dual clutch nine-speed gearbox. The Acura NSX sits on 19-inch front & 20-inch rear wheels shod in 245/35Z R19 front and 295/30Z R20 rear tires and stops efficiently thanks to six-piston front & four-piston rear calipers coupled to carbon ceramic brake discs. Compared to the 2013 concept, the production-ready NSX has grown in length by 1.8 inches to 176 inches (4470mm); in width by 5.1 inches to 76.4 inches (1940mm); in height by 1.8 inches to 47.8 inches (1215mm) while the wheelbase is now 0.8 inches longer at 103.5 inches (2630mm). The production-ready Acura NSX comes with a dial-operated Integrated Dynamic System with Quiet, Sport, Sport+ and Track modes which depending on choice adjust the settings of the engine, electric motors, gearbox and chassis, as well as the engine sound level. There’s also a launch function which uses the combustion engine and all three electric motors for a “zero delay” launch performance. Full technical specifications and performance details are (still) not available at this point while pricing is estimated to kick off at $150,000. Further details can be found in the attached press release.